You’ll follow a similar pattern as an English language learner. In other words, the first step is often the hardest. But once you master the basics, your skills will skyrocket. The problem is that many beginners often struggle to find the right lessons for their learning style and level. And even when they do find great lessons, those lessons usually only focus on a narrow part of the English language. In this post, we’ve searched the whole internet and picked the easiest and the best lessons for beginner English learners on a wide range of language skills. This master list covers all the basic topics that any learner needs before going further into their English learning journey. To make things easy, we’ve grouped our easy English lessons by category. Below, you’ll find lessons for vocabulary, numbers, special types of verbs, pronunciation and even exceptions to English rules. These vocabulary lessons are the best way to begin learning the basic words of English so you can quickly start using the language in daily life. If you want even more vocabulary lessons that are perfectly suited to your level and interests, FluentU is the best option. FluentU takes authentic English videos, like movie trailers, music videos, inspiring talks and more, and transforms them into personalized English lessons. As you watch a video, you can click on the captions for an instant definition of any word. You also get flashcards, exercises, full transcripts and other tools for each video. That means you’ll actively build your vocabulary while you absorb English the way native speakers actually use it. The videos are organized by genre and learning level (beginner through advanced) so you can quickly find ones that work for you. Want to learn easy English lessons with Disney’s mega-hit “Frozen?” Or a funny commercial starring Justin Bieber? Plus, FluentU will also remember what you’ve learned and suggest more videos based on that information. You can check out the full video library for free with a FluentU trial. Most people start learning new words without a plan or a structure. They simply try to hear new words and memorize them instantly. But after a few hours, most of this learning is lost. Learners are often unable to remember the right words at the right time, making it even harder to master English. A strategy is a plan to achieve a longterm goal. And the vocabulary strategies in this lesson will surely help you throughout your language learning journey. With these strategies, you’ll memorize English vocabulary faster and more effectively. The bathroom is usually the first place we go after we wake up. Knowing the names of the objects that you commonly find in the bathroom can be quite helpful for many learners. This is especially true if you’re planning to visit an English-speaking country. This lesson does a wonderful job of including everything you can possibly find in a bathroom. It also describes some objects that are found outside of the bathroom, too. For instance tiles are thin pieces of stone or baked clay that are used to cover any wall, floor or roof. Similarly, a trash can holds garbage and is found in lots of places besides the bathroom. This lesson uses images to both show you the objects and to give you practice at the end. Many English learners either start studying English in classrooms or plan to eventually study in a school or a college. Knowing words for basic things in the classroom can help you relax and be confident while you’re there. This cartoon video shows you common objects like a blackboard or a textbook, which you’ll find in all classrooms. The video also shows you the spelling of every word while speaking it aloud. That means you can use this video for basic reading practice along with vocabulary building. This is a topic that often confuses even native English speakers! When someone asks you how you’re doing, what do you say? Since these answers are often used interchangeably, many English learners assume that both words have the same meaning. However, the word “good” is an adjective, which means that it’s used to describe or modify a noun. The word “well” is an adverb and it modifies a verb. This video will explain the difference between “I am good” and “I am well,” plus how to use both words in several other contexts. The environment is the natural world as a whole. We can talk about the environment of the planet or of a specific place. In this lesson, we get to learn the most commonly used English words for this topic. Since the world is going through a massive environmental crisis, this topic has become quite common in daily conversation. Although the words themselves sound technical and academic, native English speakers use them in informal and causal contexts, too. For instance, you’ll see many companies use the word sustainability in their ads. The phrase green movement is also very popular now, since some political parties have also adopted this label to describe themselves. This video lesson will walk you through the essential environmental vocabulary you need for conversations on such topics. Numbers are relatively easy to learn since they can only be used in certain ways. Their meaning remains constant and generally doesn’t change from culture to culture. This makes it very easy to translate and understand the names of the numbers from your language to English. Plus, even if math isn’t taught in English in many countries, the basic English names of the numbers still might be introduced. But numbers are also harder to remember because their meaning often isn’t tied to the context of a sentence. These easy lessons are the perfect way for beginners to start learning numbers in English. This video gives you the names and the symbols of the first hundred numbers in English. This video is best for regular practice while you start to learn English numbers. Since it’s very hard for anyone to memorize all the numbers at once, try to learn 10 numbers at a time per day. This will help you review the numbers you learned earlier when you play the video again before learning the next group of numbers. Since the video is fast, you might want to slow the audio down. Just click the gear icon at the bottom of the video screen and then adjust the speed. While repeating the numbers, focus on how the instructor moves her mouth to pronounce the names of the numbers. This will help you pick up the accent as well. If you’re the kind of person who likes to learn through music, then this video is for you. The narrator uses the rhythm of the music while speaking out the names of the numbers. The video’s pace is slower than the one above and this might be more suitable for learners who are just starting to learn English. But since the instructor can’t be seen in the video, you can’t see their mouth movements as they say the word. This might make it harder for beginners to pronounce the names of the words properly. This one is sort of a bonus. You’ll hear and see some numbers in English, but the main focus is mathematical symbols. The presenter first names each symbol and then goes on to explain what they do. The lesson is great for people who’ll eventually go into technical fields. But since this level of math is generally expected of anyone, knowing the names of these basic symbols is also really important for any English speaker. Auxiliary verbs might sound complex, but their role is actually simple in English. They’re also called “helping verbs,” because they help the main verb in the sentence. Do, be and have are three main auxiliary verbs in English. This lesson gives an in-depth summary of how these verbs are used in informal English. The instructor focuses a lot on the different forms of these verbs. She also talks about when to use contractions and when the verbs are absent in the sentence. The video is extremely useful for beginners as each section is filled with examples where the important words are highlighted in red. While watching the video, be sure to pause when the examples are shown. Notice how the rules are applied and make sure you understand them. If you don’t, then go back to the beginning of the section and listen to the instructor again. Modal verbs are a special kind of auxiliary verb that express necessity or possibility. Words like must, should, can, will and may are all modal verbs. This lesson lists out three main mistakes most learners make while learning these verbs. It also gives examples of both correct and incorrect usage of modal verbs. After this lesson, test your abilities with this quiz and see if you understood the concepts correctly. All of them use phrasal verbs, a special type of phrase that includes a verb and preposition or adverb. Phrasal verbs are usually very difficult for English learners. In this video lesson, Dawn Severenuk shares a very helpful tip that can remove the usual confusion. Instead of trying to memorize every phrasal verb, Dawn suggests that you try and look at the prepositions and the adverbs. She notes that in every phrasal verb, the same verb can have a very different meaning depending on the sentence. But the meanings of the adverbs and the prepositions usually remain the same in these phrasal verbs. For instance, the meaning of “up” in almost all phrasal verbs is related to finishing or completing something. This easy technique will help all learners figure out the meaning of a phrasal verb and save a lot of time for beginners. If you’re still unsure about your ability, then you can try doing these phrasal verb exercises to test your skills. The connection between letters and sounds in English always seems mysterious to beginner English learners. It may seem like the rules of pronunciation are messy, but there are ways to determine what a word sounds like. These lessons will give you the basic knowledge you need about English pronunciation to start saying easy words correctly. Do you often find yourself pronouncing English words the same way you’d pronounce them in your native language? Or do you find it hard to pick up the accent of native speakers even when you know that they sound different? Most of these problems arise with all language learners. We’re just used to speaking in a certain way from our native language. In this lesson, you’ll learn about a technique called backchaining that’s used by professional actors and language teachers. With backchaining, you pronounce the last sound of a word first and then keep moving forward. This helps you understand the individual sounds of the word better. It also helps you get familiar with the common groups of sounds in English. Do you remember learning your native language? Probably not. That’s because as children we pick up language automatically. This video explores how babies learn to speak a language, then lists three ways second language learners can imitate their success. As the video shows, babies focus more on the stress and the feeling of the words first. This allows them to express and communicate in some way before even learning the proper words. Babies also observe the movements of the mouth as others speak to them and constantly imitate. This video will expand on these ideas to give you tactics for learning English the natural way—like a baby! General strategies are good to keep in mind, but the main challenge is always to pronounce individual words. This lesson presents seven words that are usually difficult for beginner learners. The instructor pronounces each one of them, focusing on the individual sounds and the stress. This video gives you a good idea how English spelling relates to common patterns of pronunciation. These patterns occur throughout the language and this video is a good first step towards building up your advanced vocabulary. There’s no better example of the messiness of English pronunciation than this particular group of letters. The way you speak them changes with almost every word. This video gives a nice summary of how and when the pronunciation changes. It also gives you plenty of examples that you can use in general vocabulary practice. This is one of the most frustrating aspects of the English language for many learners. You spend hours learning the sounds and combinations of various letters. But then you discover that sometimes a letter is added to a word even though it’s meant to be ignored in pronunciation. 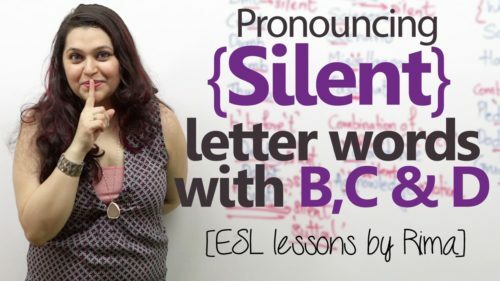 This lesson lists out some common rules you can use to figure out when the letters B, C and D are silent. Silent letters are so common in English because of the language’s history. Learning how to recognize their patterns now will make pronunciation much easier as you continue learning English. The English language can take anyone by surprise. For every grammar rule, there’s almost always an exception. This section is all about helping you be aware of the exceptions. I’m sure you’ve come across similar sentences before. The article “a” is used before words that start with consonants, but “an” is used before words that start with vowels. This lesson will show you the exceptions to the rule above, which will help you sound like a more natural English speaker. Do you know what stative verbs are? Instead of describing actions (like to run) they describe emotions, relationships, thoughts and any other state of being. Usually these words aren’t used in the continuous form (which are words that end with “-ing,” like running). But sometimes stative verbs break this rule. The most common instance is in idioms or phrases. “It’s really weighing on my mind” is one such idiom. McDonald’s famous slogan “I’m lovin’ it” (lovin’ is short for loving) is another example. This video will help you understand those types of exceptions and more. Once you go through all these lessons and master the basics of English, don’t forget to check our other master list of advanced English lessons. Indeed, regular practice is the only path towards fluency.